Perma-Stone, Formstone, faux stone, Rostone. 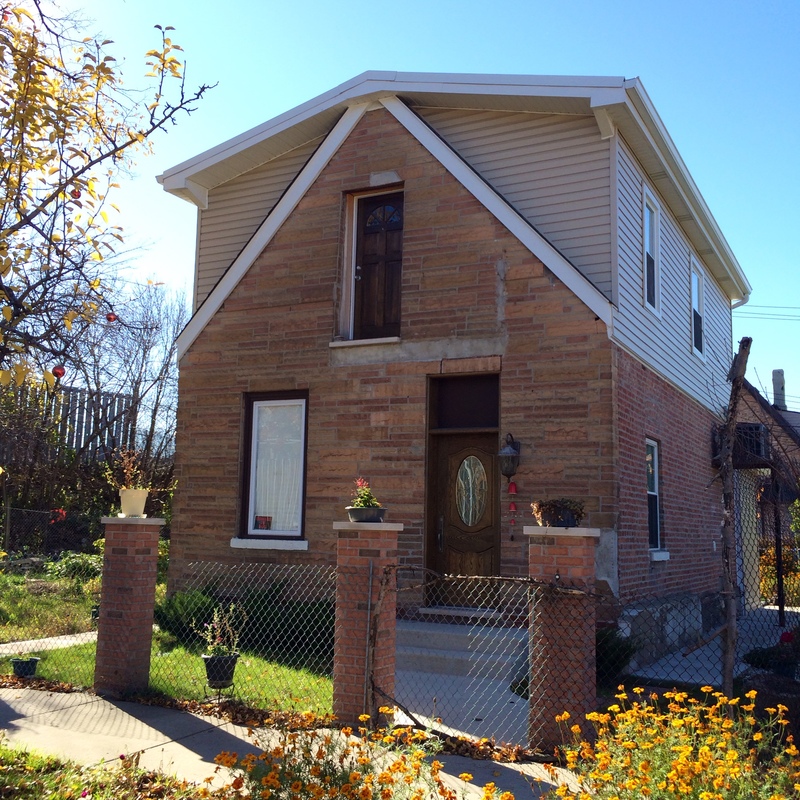 John Waters once called this ubiquitous simulated masonry the “polyester of brick.” From the 1930s through the 1950s, companies all over the United States were pitching faux stone siding to homeowners as a modern update to the exteriors of late 19th century buildings. Made of shale, lime and water, the unbaked permastone slurry would be pressed into stone shaped molds and heated, creating a stone-like “cracker” that could be applied to the exterior of a building. Permastone came in an array of colors, textures and stone types, and sometimes mica would be added for extra sparkle. Widely toted as maintainance free, permastone could be easily adhered anywhere on your building by anchoring it with chicken wire lath, or simply adhering the permastone panels with cement directly to the façade. 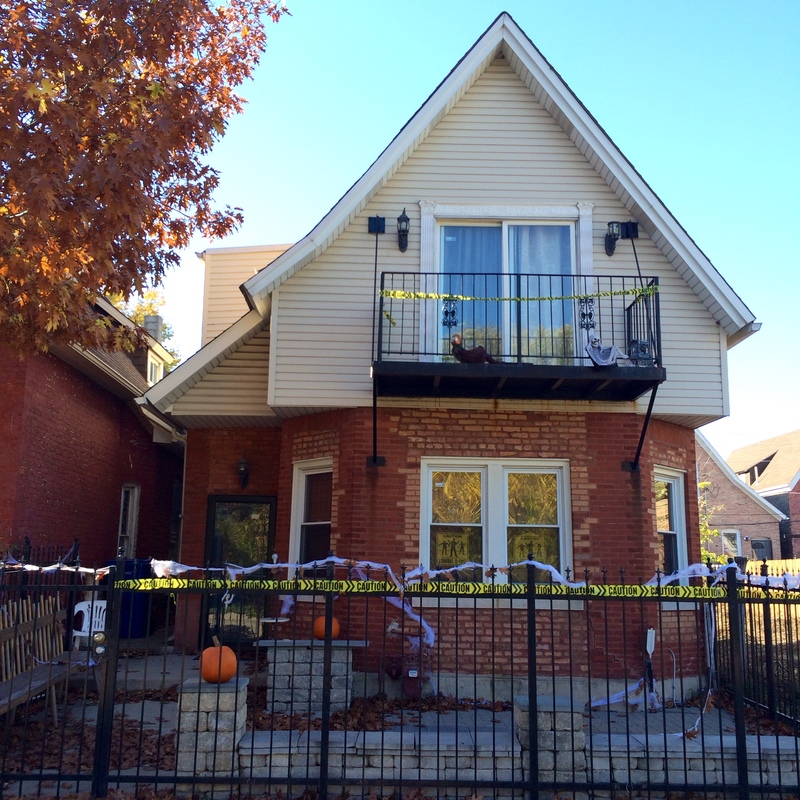 Tucked into the northernmost corner of Illinois, Lake County is where Chicagoland thins out. 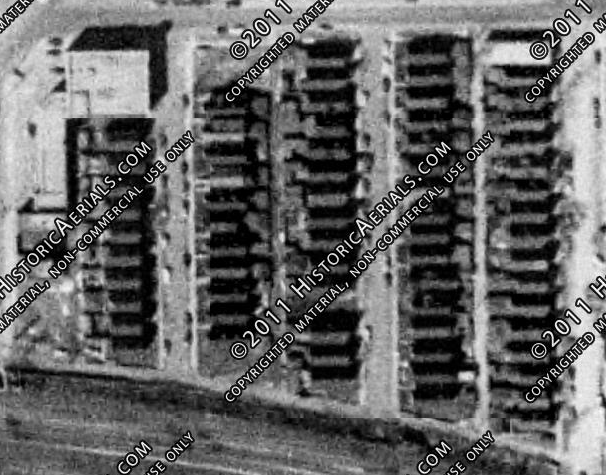 Highways widen, development becomes sparser, and strip malls give way to midcentury ranch homes on acre lots. Small farms are still spread along the Tri-State Tollway, with silos and barns peeking above the treeline during the winter. The rollercoasters of Six Flags Great America sit tight and quiet, awaiting another thrilling season. Along with an optic white, 55 foot statue of Ramses II. This is the home of Jim and Linda Onan, who would serve as collaborators throughout the design and construction of the six-story Gold Pyramid and its spectacularly bizarre and exciting 10 acre grounds. Assisted by their son Rocko, and inspired by the pseudoscience behind Pyramid Power in the 1970s, Jim acted as de-facto gentleman architect, designing and building a replica of the Great Pyramid of Giza that is 1/9th the size of the original in Egypt. While President Thomas Jefferson found inspiration in Italian villas, Jim Onan, a concrete contractor by trade, looked to the ancient world. That’s right. This is a house like no other. The only pyramid shaped house in the world. The Gold Pyramid in Wadsworth is proportionally perfect to its sister structure at Giza, and set along the same true north directional axis. This alignment was so important to Onan that when it was discovered that an original foundation wall was off of this axis during construction in 1977, the existing work had to be scrapped and the wall realigned. This axis, along with the natural spring located below the pyramid, is believed to give the pyramid supernatural powers. However one may feel about this claim, the spring allows the pyramid to be heated and cooled through a geothermal system that Jim Onan designed himself. Construction was ripe with the Onan’s trying different techniques to solve complex engineering problems. The Onan’s don’t claim to be architects, fans of high architecture, kitsch or postmodernism. This is their home, and a physical manifestation of their love of all things Egyptian. This is a family obsessed over generations, and that dedication shows in the objects and the stories behind them. The exterior of the Gold Pyramid is simple and harmonious. Currently clad in gold paint (the Pyramid was originally covered in 24 karat gold plates) the pyramid’s front door is barely visible up a set of stairs within a rectangular recess. Windows are mullionless plate glass set in a haphazard but functional rhythm. It could easily be believed that Michael Graves travelled to remote Lake County to build a structure that had all of the promise and fun of his renderings, designing a series of workhorse front-facing gables that worked so hard they mighty-morphed into a pyramid. Jim Onan found inspiration in his own interpretation of Egyptian visual language, an approach vastly different than the architects of the lotus flower capitals and cavetto cornices of the Reebie Storage Warehouse in Chicago (George Kingsley, 1922) or the First Presbyterian Church in Nashville (William Strickland, 1848). Is there a precedent for Egyptian Revival Postmodern Outsider Architecture? There is now. For all of the simplistic elements of the exterior, the interior is very busy-part family home, and part gallery, where Egyptian objets d’art and collectables live freely among pastel Chintz upholstery and billowing white window valances. The ultimate result is a lovingly curated space, where obsession and domestic ease work joyfully together. This is Linda’s contribution as interior designer. Family portraits, suggesting the life of an atypical Midwest family growing up in the 1980s, surround a tapestry of Ramses in the living room, collaboration between Linda and Rocko. The dining room, designed in the shape of a cartouche and located at the absolute center of the pyramid, is filled with real gold objects. A needlepoint portrait of Nefertiti, a gift from a family friend, is displayed beside 16th century Shawabtys, given to the family by the Egyptian government, with whom the Onan’s have enjoyed a fruitful relationship across decades. The home is full of Rocco’s ambitious adolescent projects, including a detailed medallion nearly four feet in circumference, and a 24 karat gold leaf front door. Walls throughout are covered in bright, beautifully stylized depictions of life in ancient Egypt, and done over the course of three years by a sign painter from Zion, Illinois. Through the 1980s and 1990s the Onans raised their five children, while continuing to add elements to their Post Egyptian estate. The site now includes a four car garage in the form of three small pyramids, a moat, and an exact replica of King Tutankhamen’s tomb in the Valley of the Kings that includes a model of Tut’s mummy and sarcophagus. After the Onan’s opened up the pyramid to tour groups, they filled a gift shop with Cleopatra beach towels and replica brick-a-brac, and the long strip of pavement leading up to the house was flanked with repeating Bull Mastiff-sized Sphinx figures. After some interference from Lake County zoning officials, a 55 foot, 2,000 ton statue of Ramses II was constructed at the end of the driveway. Beats the hell out of a concrete goose wearing a Blackhawks jersey, doesn’t it? Perhaps what’s more outstanding than the pyramid itself is the desire by the Onan family to be a part of an official conversation about cultural heritage, and there should absolutely be a seat for them at the table. The Onan’s have come to their interest in being designated as a landmark because they recognize and celebrate their own work and dedication to a level of creativity. This lies at the core of why we want to preserve what is special about our built environment, and the type of people that heritage conservation should want to please. They wish to see the Gold Pyramid included on local and national lists of landmarks, and have come to this conclusion on their own, without any prodding or outside influence from state agencies or historians. This is the type of progressive thinking about cultural heritage, the type that comes naturally to the folks at the Gold Pyramid, that we need to encourage in order to survive-the type that people-not preservation, pushes on its own. Perhaps it’s magical thinking to envision a world where we don’t need historic districts, local landmarks designations, or demolition delay to keep great buildings around to serve our future, but maybe this is a start. Could we realign ourselves with a message that in preserving our architectural heritage, we provide a place where memories can live forever? Could we put ourselves in the frame of thinking that realms of kitsch and roadside attractions have the potential to transform over time into an acknowledgement that history takes peculiar and miraculous terms, and that the word “historic” belongs not to the historian, but to the drive-ins, movie theatres and pyramid houses that are given historic status by the people that love them? 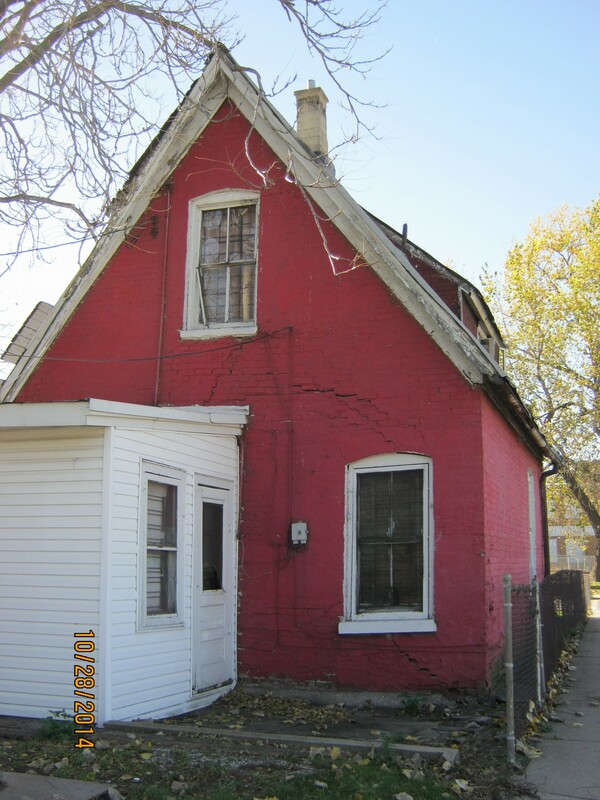 Perhaps the deepest question is “how do we get historic preservation to happen without historic preservation”? The answer might be Jim, Linda and Rocko Onan, as well as a bit of our own pyramid power. 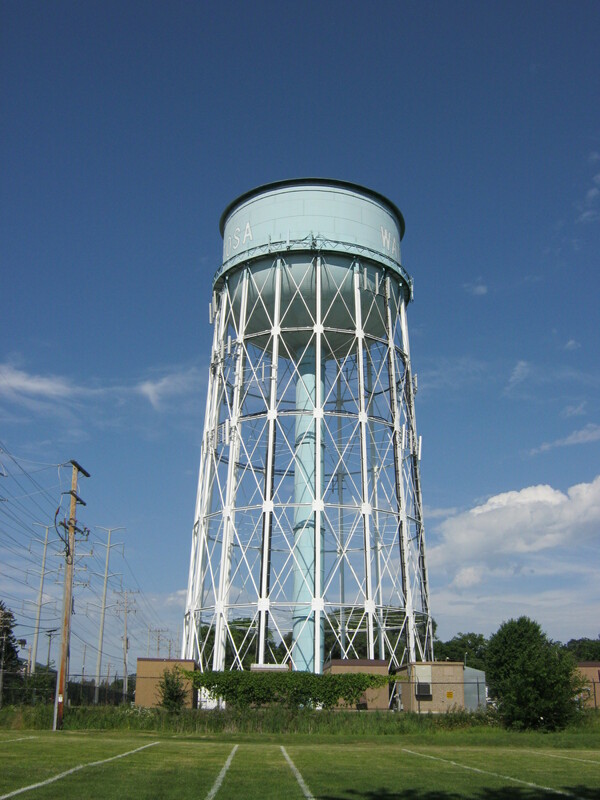 Water towers are everywhere. 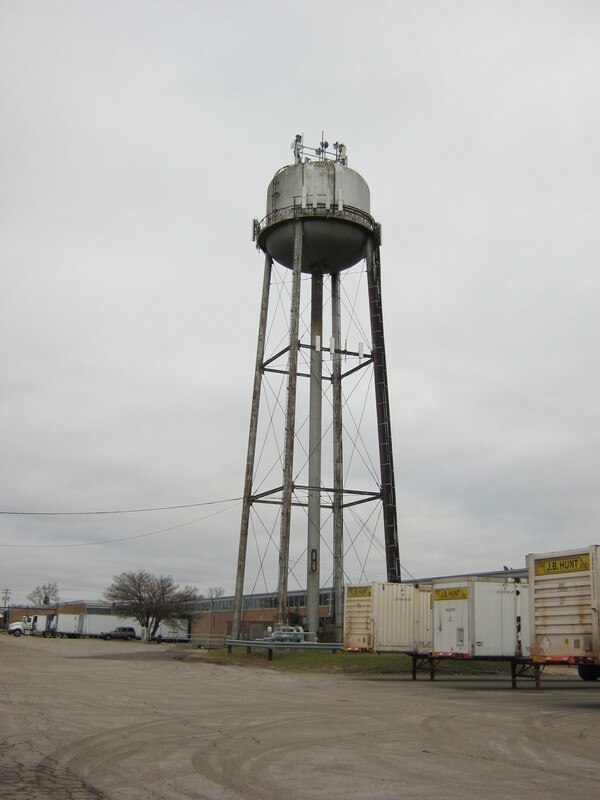 You can find them overlooking a small riverfront town, like Savanna, Illinois. 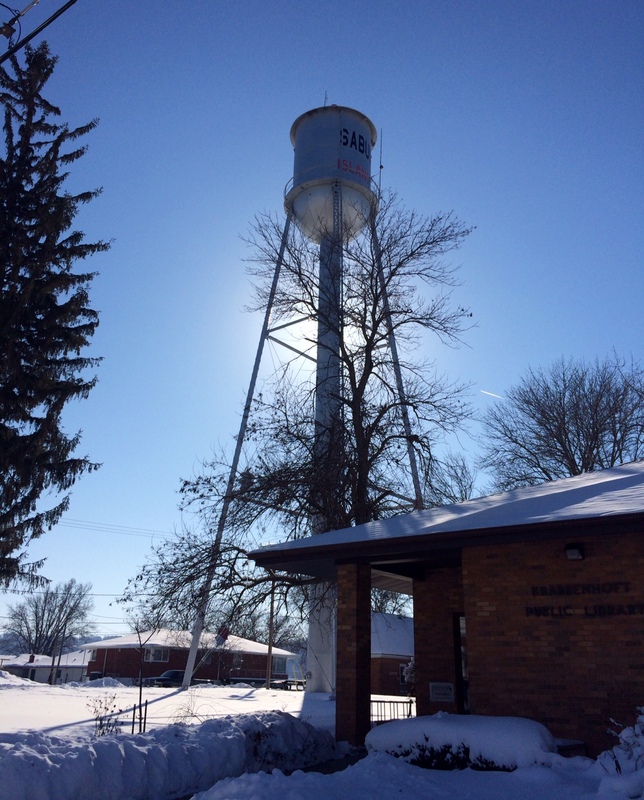 You can find them at the World’s Largest Truckstop in Walcott, Iowa, and sandwiched between the fire station and the public works office in suburban Ohio. 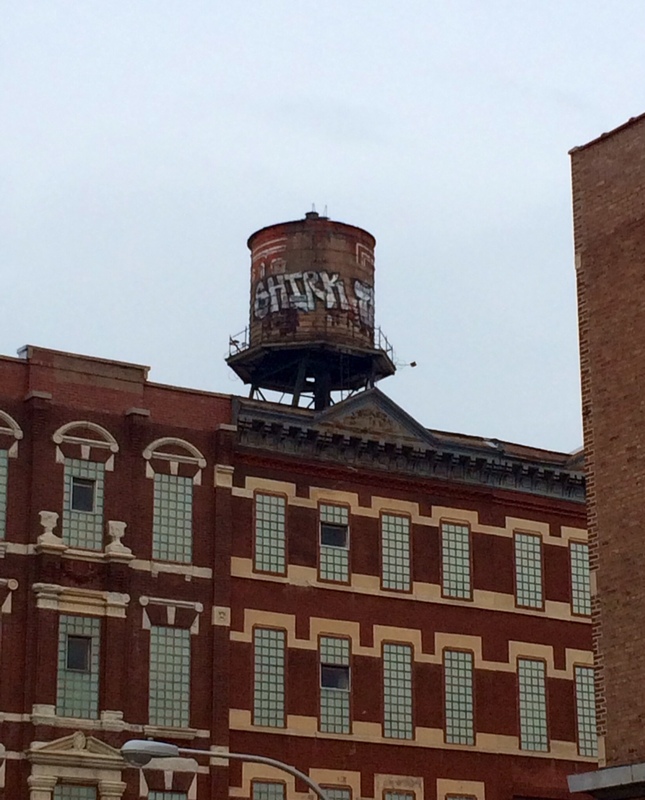 You can find them atop buildings in neighborhoods all over Chicago. They serve as navigational tools, often proudly announcing their location in contrasting colors and active fonts. Painted graphics like houses or trees serve as further clues to the characteristics of a community, as does the presence of graffiti. They can be painted to look like fruit, or shaped to look like a ketchup bottle. They also hold water! 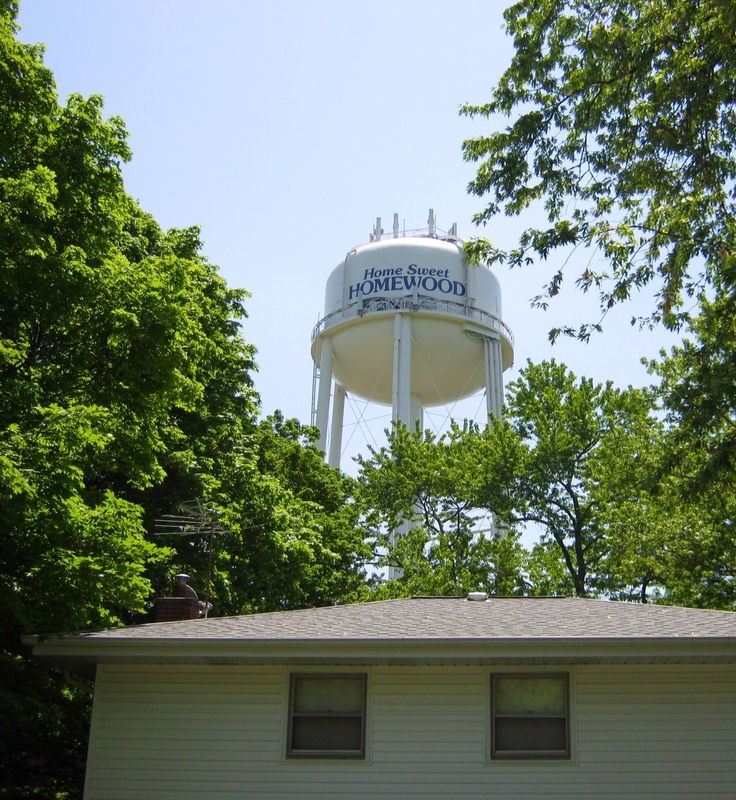 If you’re unsure about how this happens, let the City of Bloomington, Minnesota’s Public Works Department explain. While the spheroid towers make a big impression, my favorite has to be multi-column elevated towers. The more legs one has, the more it looks like its alien inhabitants have decided to stay awhile. Multi-column elevated, Wauwatosa, Wisconsin. Built 1928. Multi-column elevated, Sabula, Iowa. Built circa 1930. Multi-column elevated, St. Paul, Indiana. Built circa 1920. 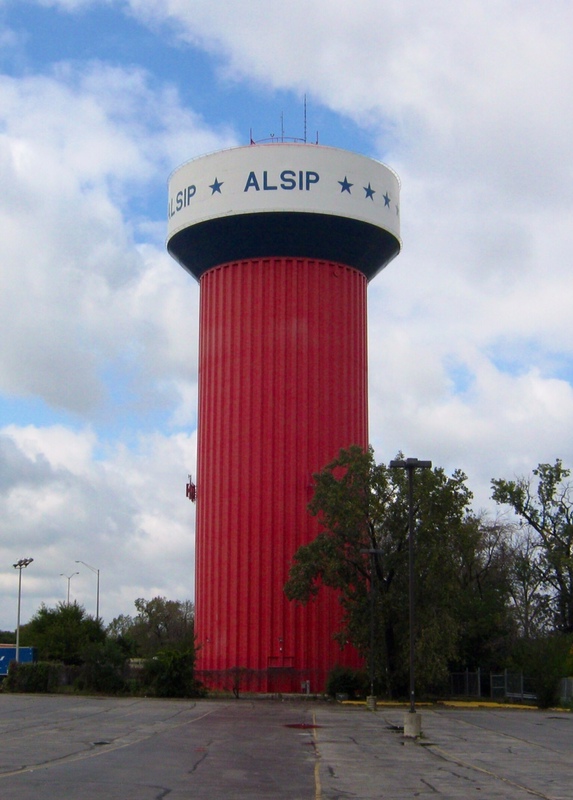 Fluted column, Alsip, Illinois. Built circa 1965. 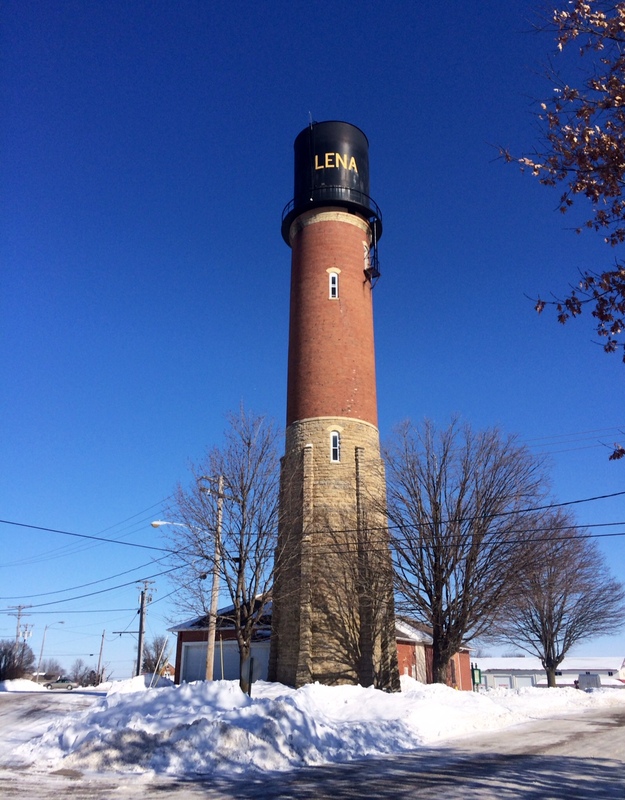 Standpipe, Lena, Illinois. 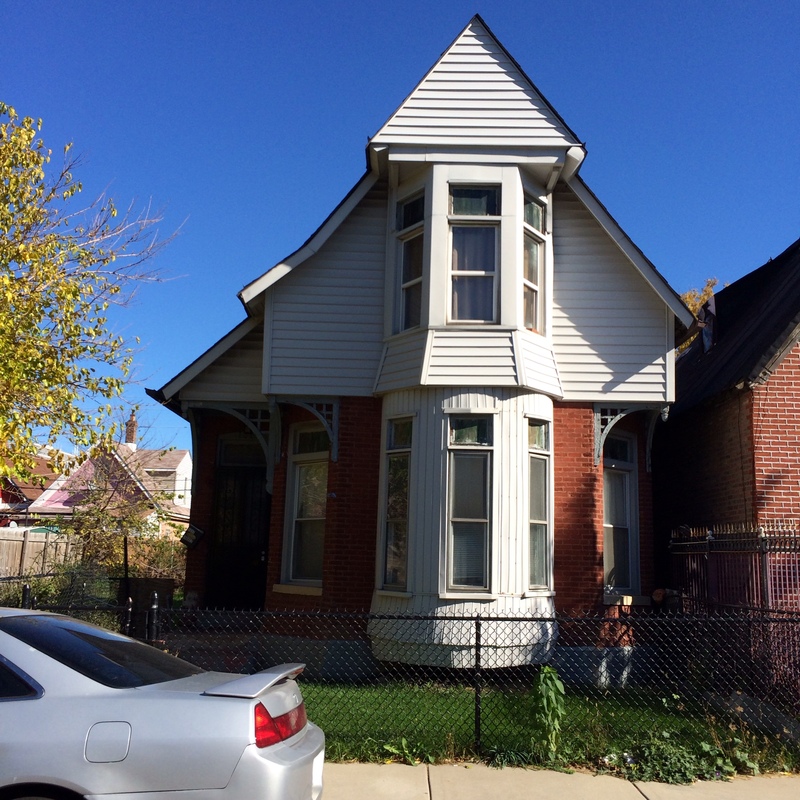 Built 1896. 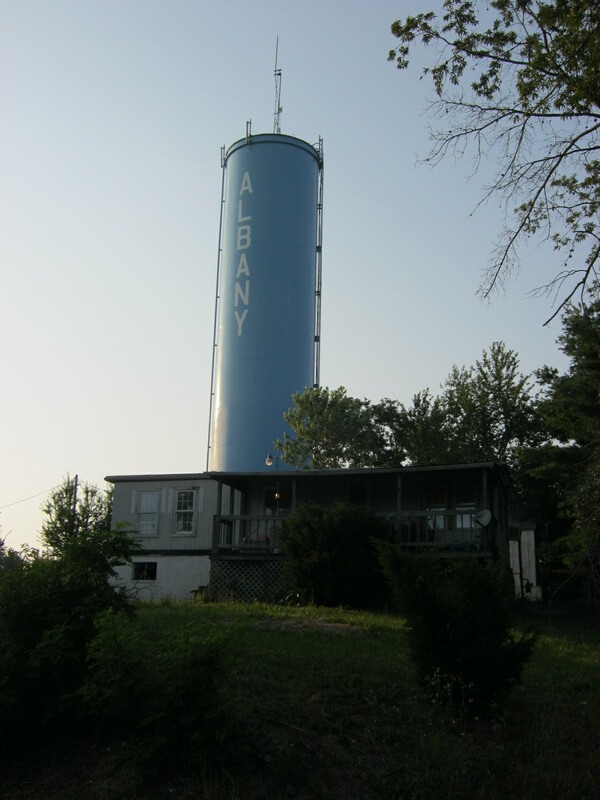 Standpipe, Albany, Ohio. Built circa 1950. 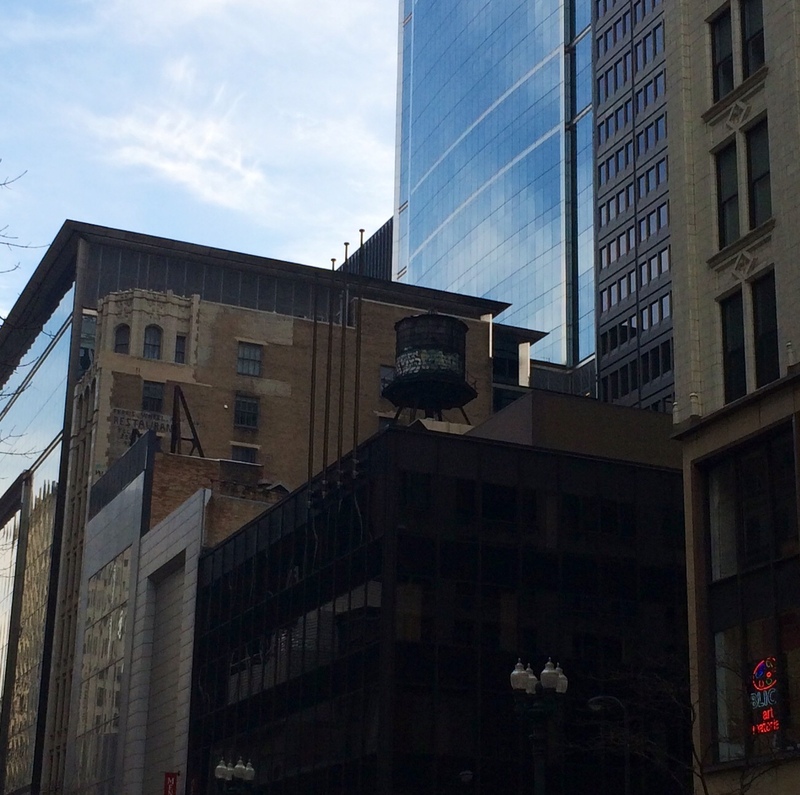 Rooftop tank, Chicago, Illinois. Date unknown. Multi-column elevated, Des Plaines, Illinois. Built 1957. 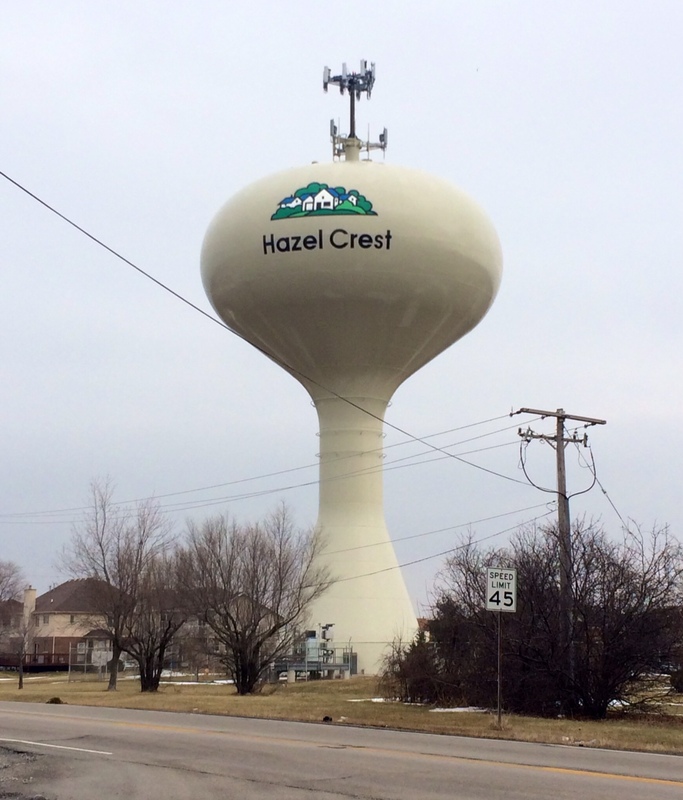 Spheroid, Hazel Crest, Illinois. Built circa 1975. 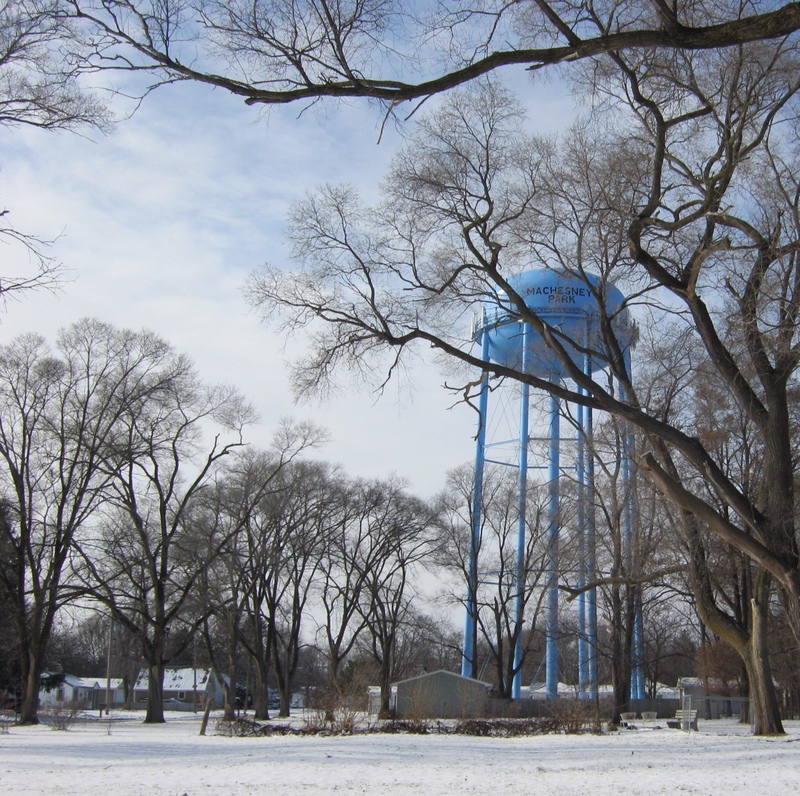 Multi-column elevated, Machesney Park, Illinois. Built 1956. 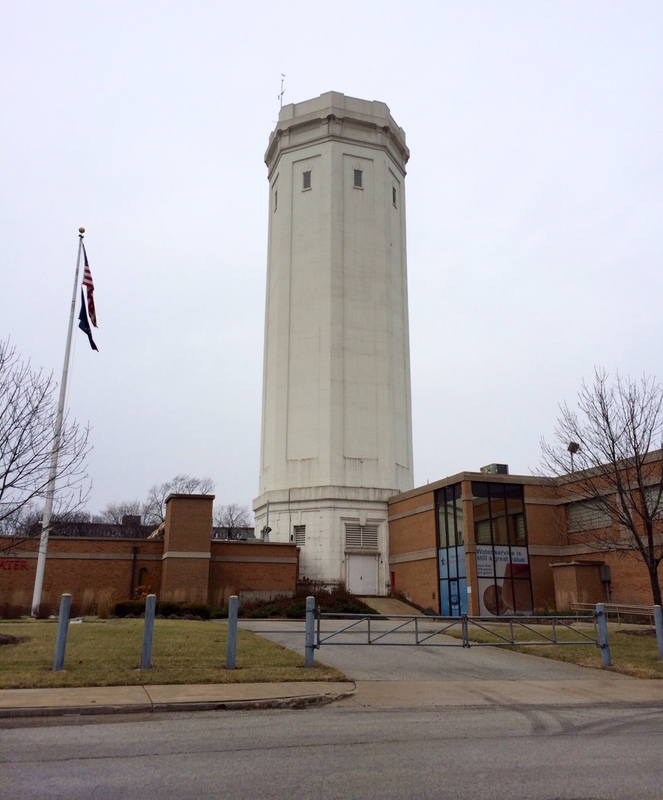 Standpipe, Gary Indiana. Built circa 1910. 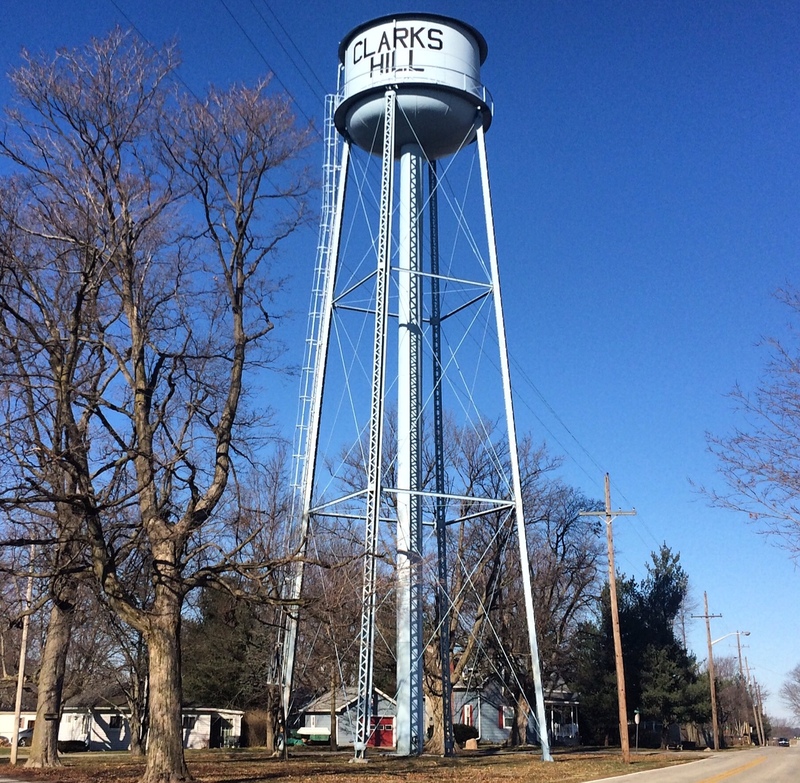 Multi-column elevated, Clark’s Hill, Indiana. Built circa 1940. Fluted column, Broadview, Illinois. 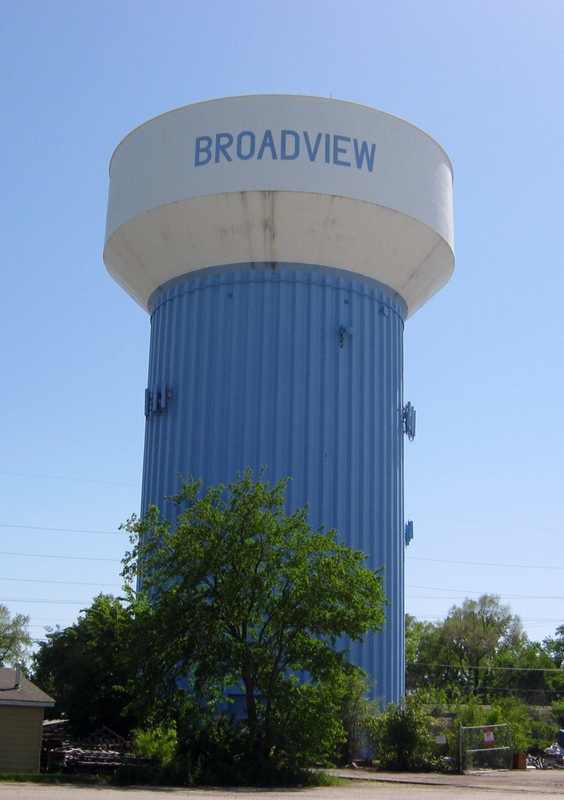 Built 1967. Multi-column elevated, Homewood, Illinois. Built circa 1950. 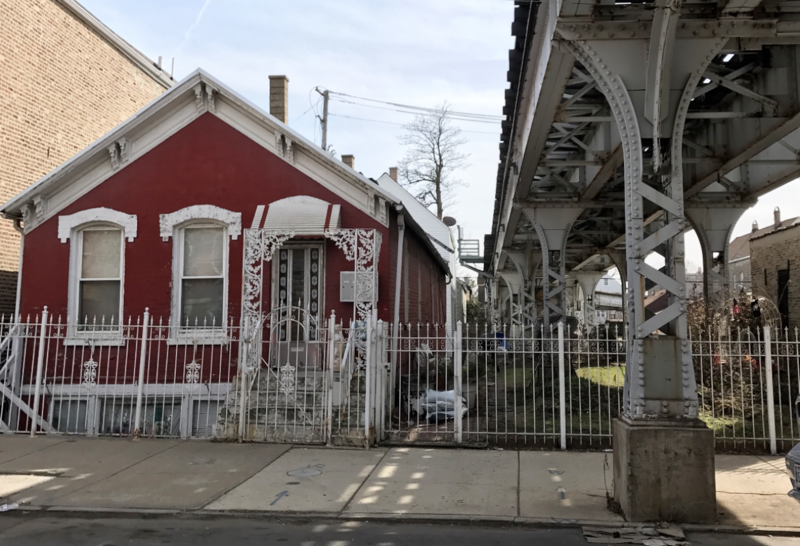 Sandwiched between a rail embankment, Western Avenue and blocks worth of industrial storage in Chicago’s Near West Side are two small streets’ worth of fascinating 1880s Queen Anne workman’s cottages, on the 1300 blocks of South Claremont and South Heath Avenues. 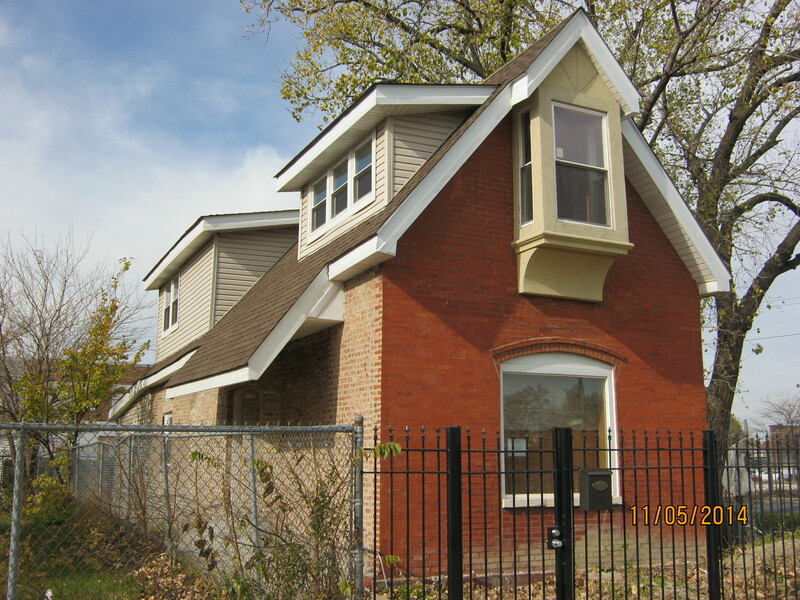 Widely attributed to be the work of architect Cicero Hine, and speculated to be an extension of an earlier development on Claremont Avenue , these cottages were added to Landmark’s Illinois Ten Most list of imperiled buildings in 2009 after two blighted cottages came up for the City of Chicago’s fast track demolition program, 1308 South Oakley Avenue and 1302 South Heath Avenue. 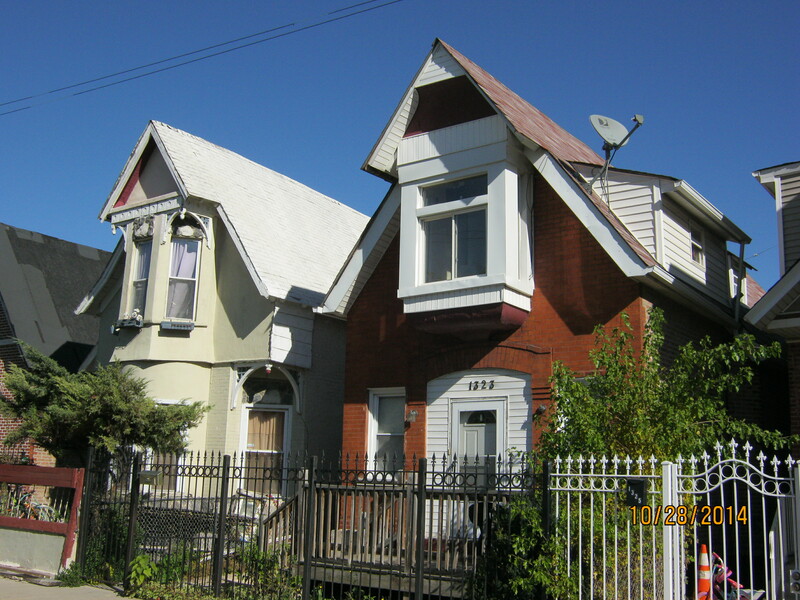 With no plans for productive reuse and the potential for the cottage’s abandoned status to attract crime and illegal activities, both buildings were demolished in 2010. With turned Aesthetic Movement decoration at corner eaves and near entryways, plaster ornamentation below rounded windows and playful variations on layout and decoration, these Victorian workman’s cottages are easy to like, and representative of a period where real estate developers worked with notable local architects, like Hine and his contemporary Normand S. Patton to design buildings that stylishly housed the laborers who would go on to build 20th century Chicago. 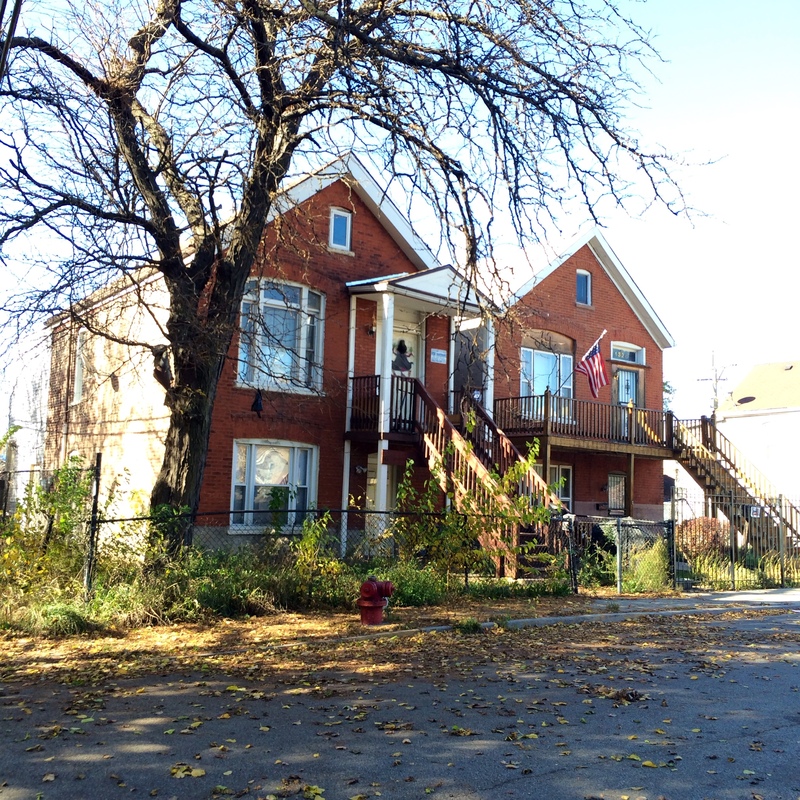 The two blocks of cottages have an odd secluded quality, a shuttered body shop protects their view from Ogden Avenue, and until ten years ago, the area to the north was comprised of industrial development, now a series of vacant lots with brick and concrete remnants still secured by chain link fences. Freight trains on the rail embankment produce a low, consistent hum. 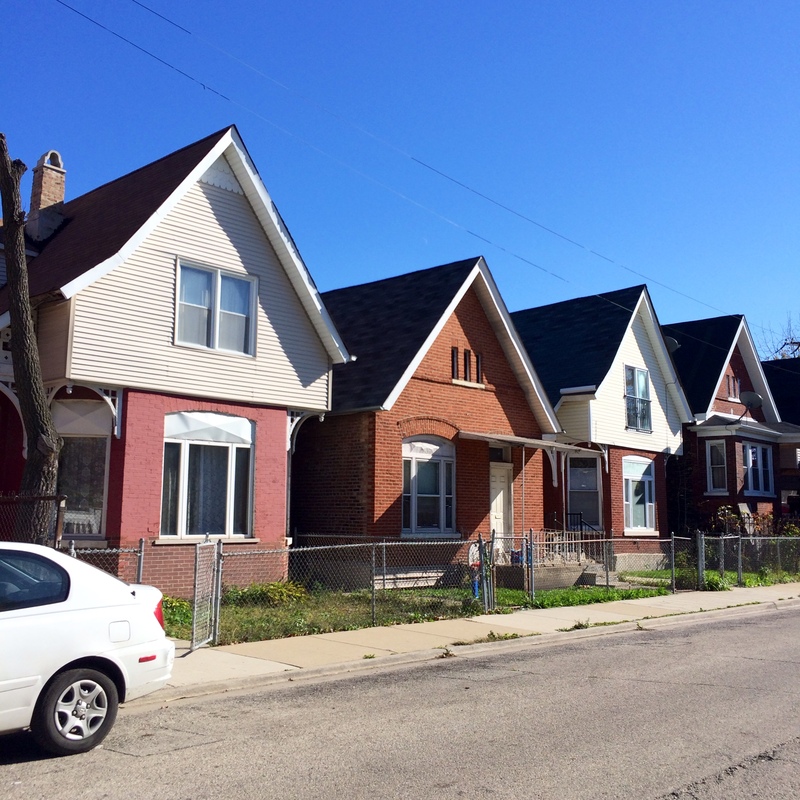 To the northwest is an all-too familiar, but eery site on Chicago’s south and west sides: an empty residential block completely devoid of houses that still retains its layout at ground level, including alleyways and concrete garage pads. 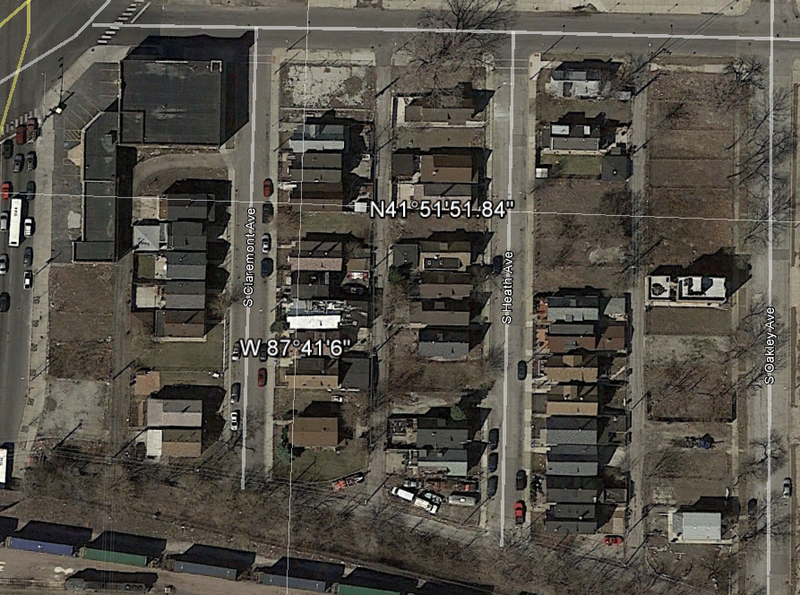 In some areas the ground has settled to suggest the foundation of an atypical Chicago two flat. Twenty years later, loss was still minimal, and the area remained dense. 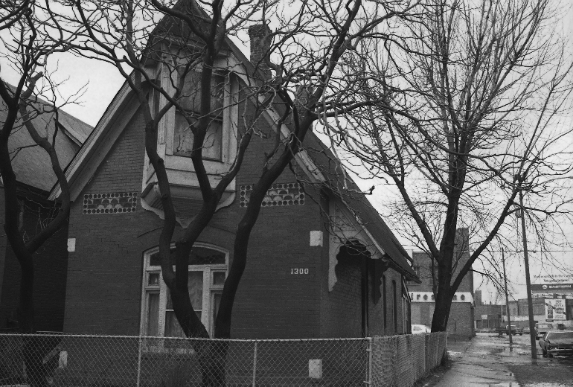 Between 1971 and 1975, the Illinois Historic Preservation Agency surveyed cottages on Oakley, Heath and Claremont, and as the photographs of individual buildings show, many of them had made it out of midcentury madness retaining an incredible amount of integrity. 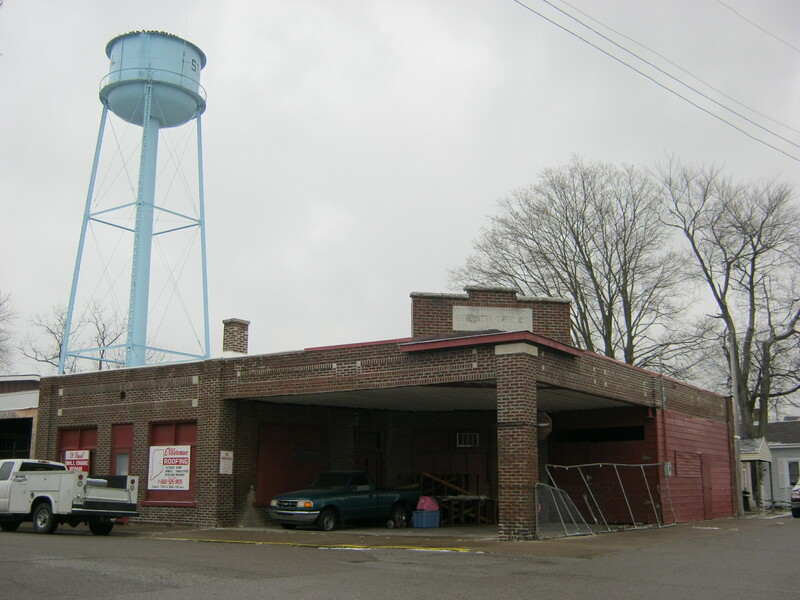 The original building density and the historic character of the area, nearly a century old, had remained intact. So why not landmark the damn thing? It seems to have had all the right stuff for designation in the early 1970s. Meanwhile, buildings in Chicago’s loop with National significance were being demolished, an era preservationists wish to forget. 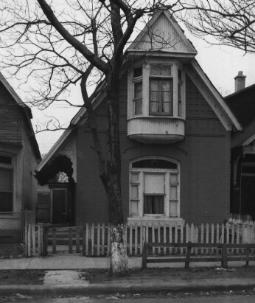 1300 South Oakley Avenue circa 1973, demolished (image via Illinois Historic Preservation Agency). 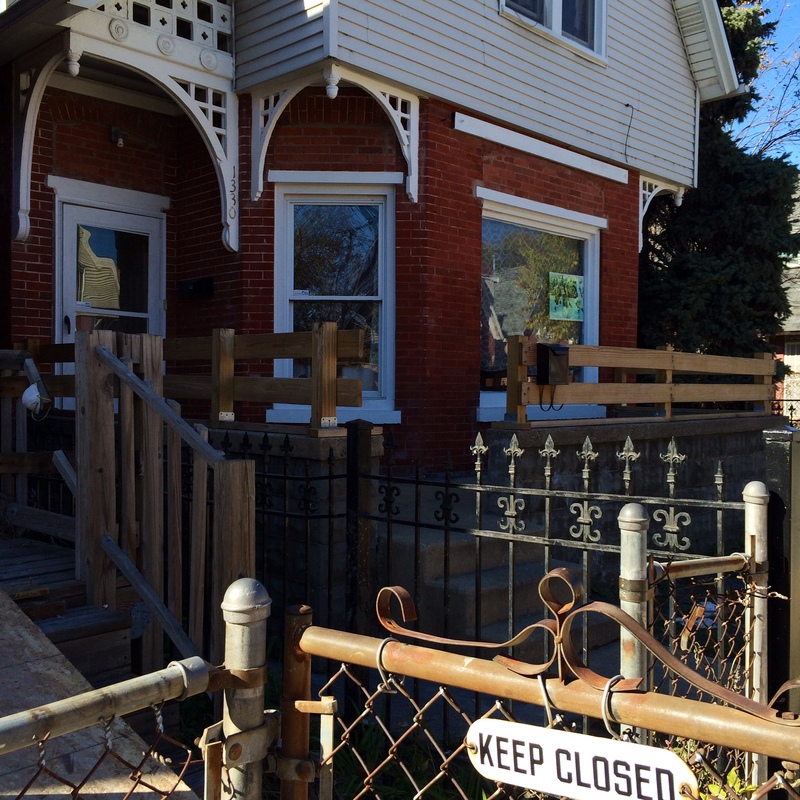 In 2013, nearly all of the structures on Oakley Avenue had been leveled, and a boring three-story residential building had popped up in the middle of the block. One late 19th century building has remained, and over time it has developed a door to nowhere. Perhaps the biggest loss here is that there was a time in history where these two to three blocks were at a confluence between integrity and recognition that was not capitalized upon by giving this area local or national designation. 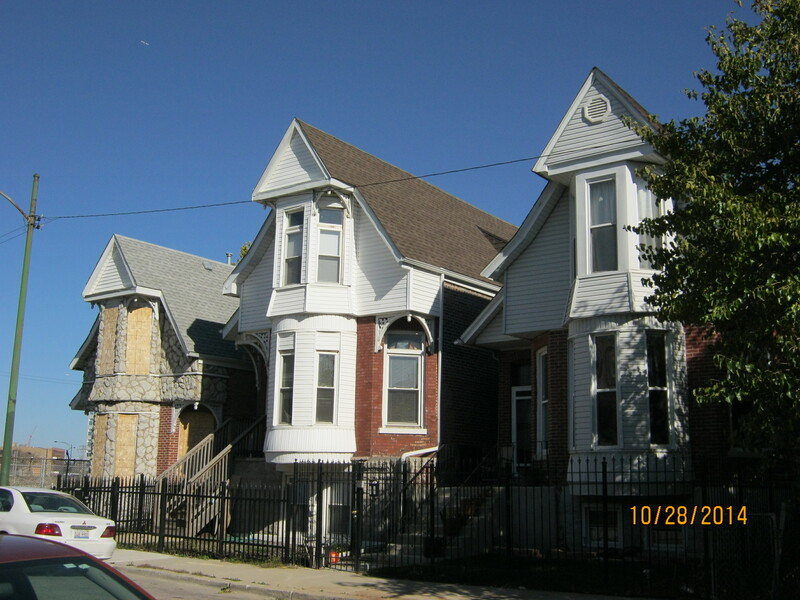 Many of the individual buildings were given an eligibility rating of “Orange” on the Chicago Historic Resources Survey, conducted between 1983 and 1995. 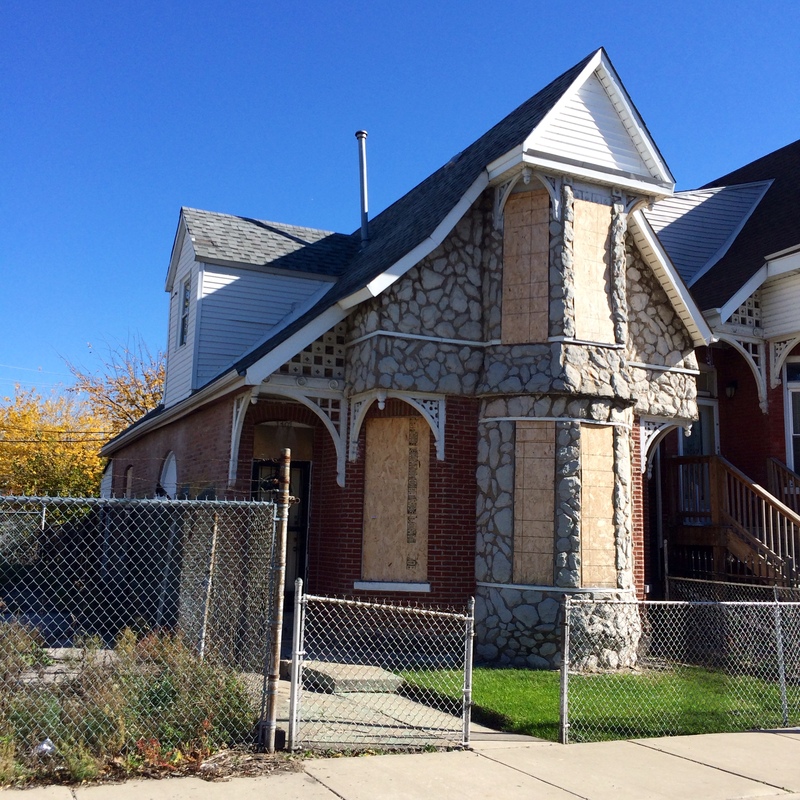 This ordinance provides the City of Chicago’s Department of Planning and Development 90 days after the issuance of a building permit to explore preservation options, but in 2014; many of those identified have had their historic character compromised. 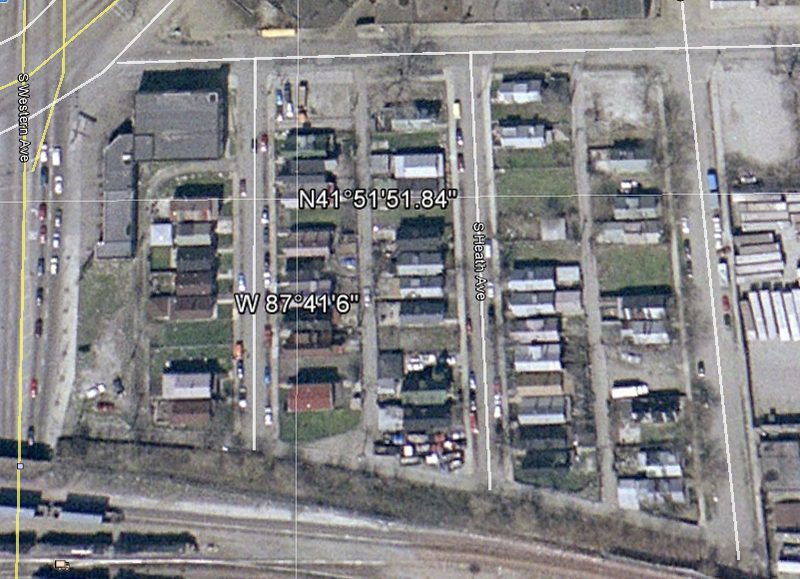 So is this area eligible for landmark status in 2014? 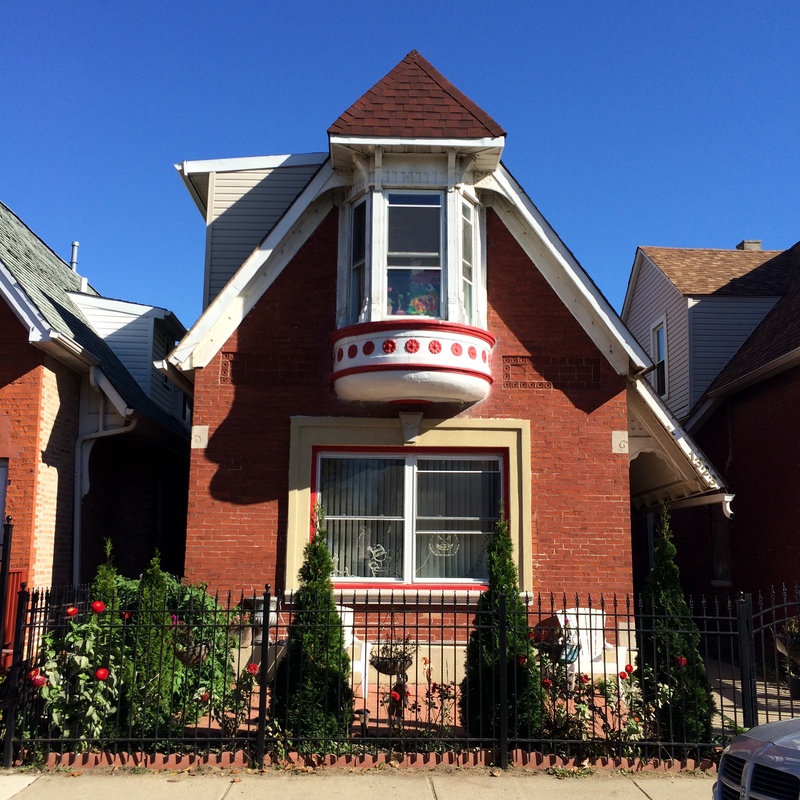 There are definitely better surviving examples of Queen Anne cottages throughout Chicago, with fewer teardowns and more integrity. 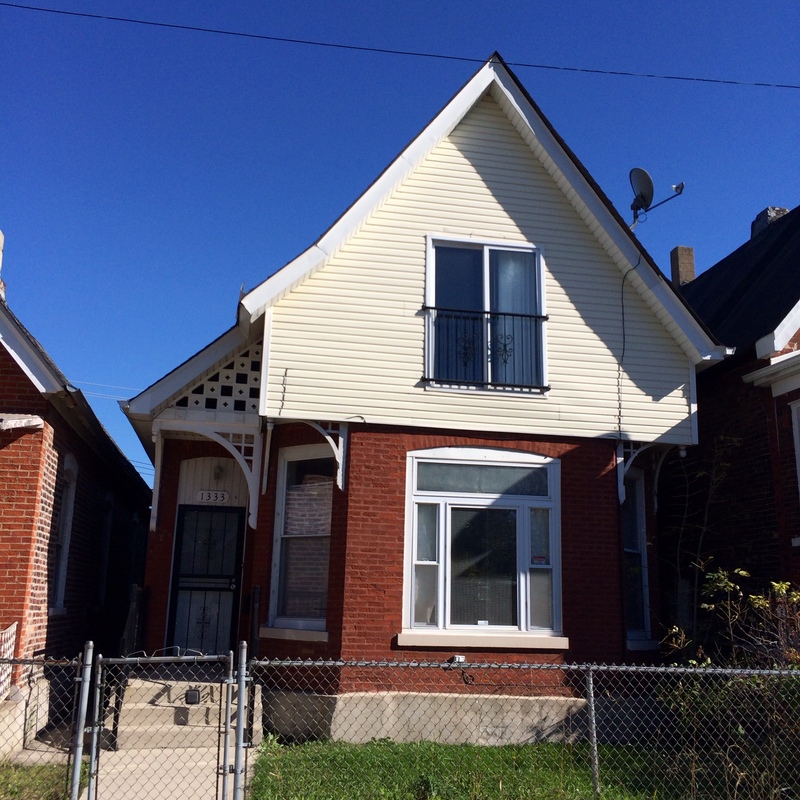 While it’s hard to make a convincing case for landmark designation now, the value in these two blocks may have an upswing. It’s a snapshot of what we do with old buildings. 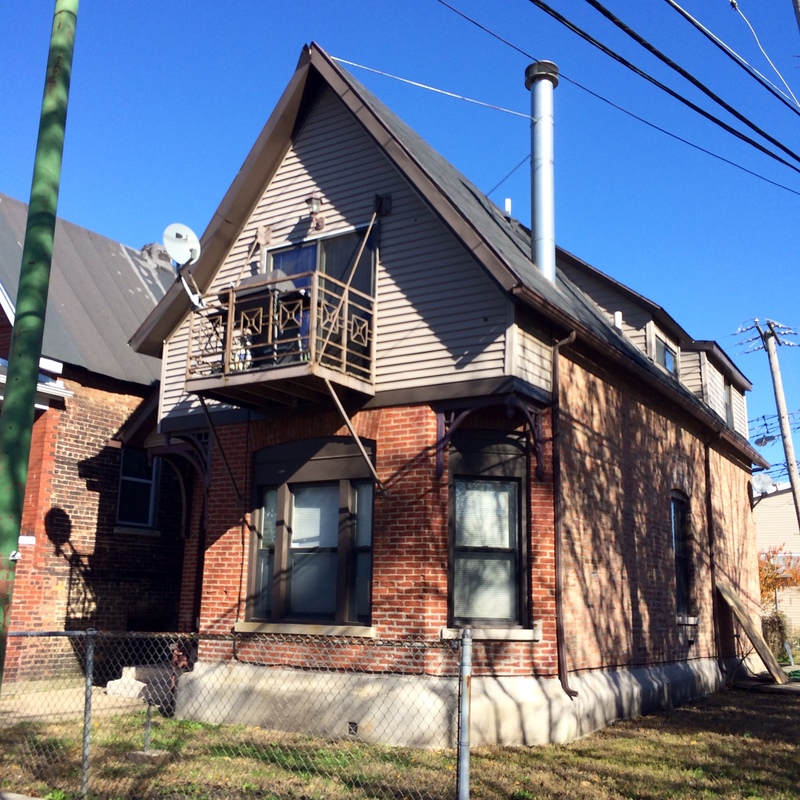 For over 130 years in Chicago, people have lived here and continuously changed these cottages to fit their needs. Through changes in the way we live, what we own, how we work and how we relax; these buildings have been altered over time to accommodate modern life. Working class people have been born, lived and died in these buildings. And they have hot rodded the hell out of them! 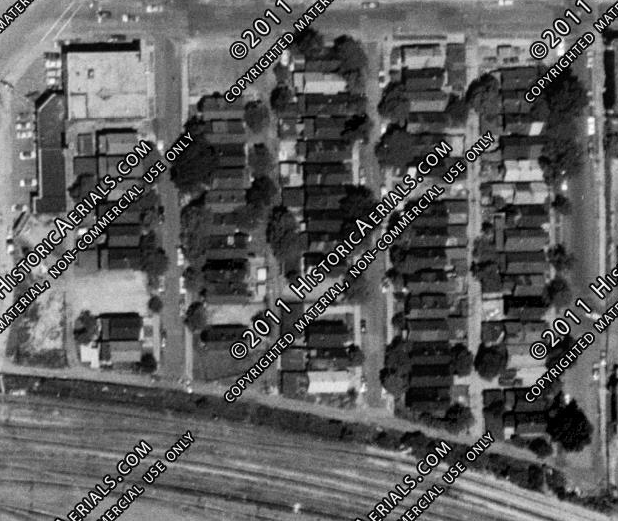 This area represents such a broad range of material and cladding changes, from wartlike faux midcentury stone on Heath Avenue, gratuitous late 20th century vinyl siding, and literally dozens of different fence types across decades. Perhaps the most interesting facade change is the addition of a balcony on the 2nd floor. Roofs are vinyl shingle, wood shingle and even hot tar. Leaded glass lights have been painted over, covered over, or in some places completely removed. 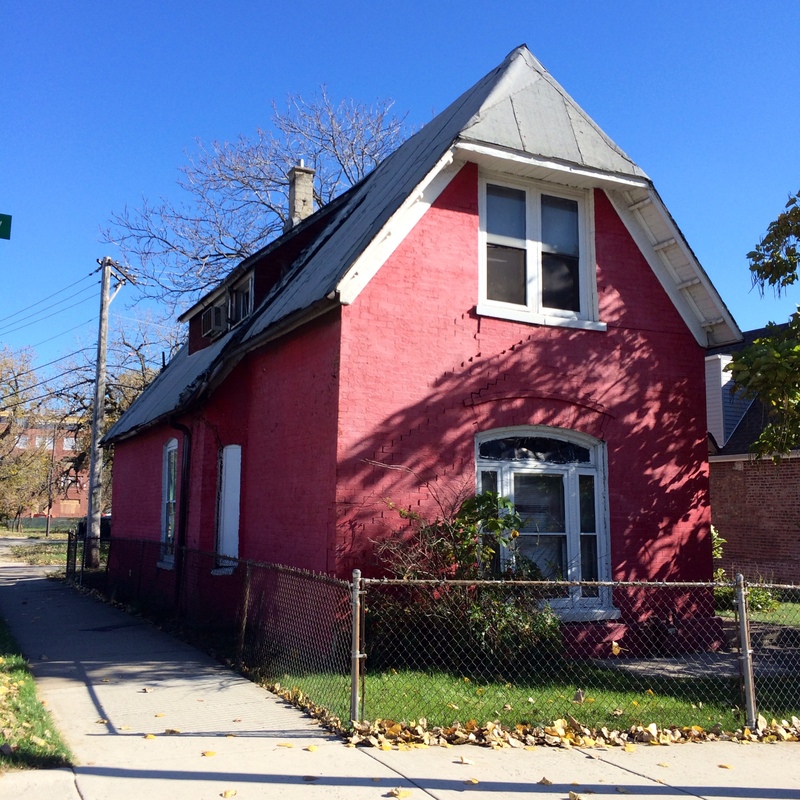 A few cottages are derelict, 1301 South Heath in particular appears as if the last inhabitants left decades ago. In terms of integrity, many of these buildings original characteristics are cancelled out by the presence of an obtrusive modern element, leaving only a few with enough original elements to actually render them significant. It’s difficult to resolve this area’s once outstanding potential for preservation against its current condition, but perhaps there is a place within the study of architectural heritage that also includes the research and observance of vernacular, idiosyncratic changes that preservationists fight so hard to prevent building owners from actually living in the buildings they love, own and live in. Old buildings, new tricks indeed. Blaservations spent most of the past week driving through southeastern Iowa, traveling heavily on Interstate 80, looking for the Hartland’s best taquerias, and blasting the Marshall Tucker Band’s Greatest Hits. And looking at old buildings, of course. In the nineteen-teens, Indiana entrepreneur (and perhaps the original “Car Guy”) Carl G. Fisher envisioned a highway that would carry Americans from Times Square to San Francisco. Fisher had made a fortune developing acetylene headlights, used on every make and model of automobile across brands for almost ten years, and would later go on to co-develop the Indianapolis Motor Speedway. The wider use of the automobile brought the conditions of American roads to a contentious point, particularly in rural areas. While the Good Roads Movement had set the groundwork for private industry (bicycle manufacturers and enthusiasts’ groups) to invest in improving roads, the modern motorcar required a smooth, even traveling path or risk cracked axles or other damage to futuristic machinery. Using private funds from the likes of Woodrow Wilson, Thomas Edison and Teddy Roosevelt, Fisher seeded the first stretch of the “Lincoln Highway” in 1913 and developed the Lincoln Highway Association to promote it, headquartered in Detroit. 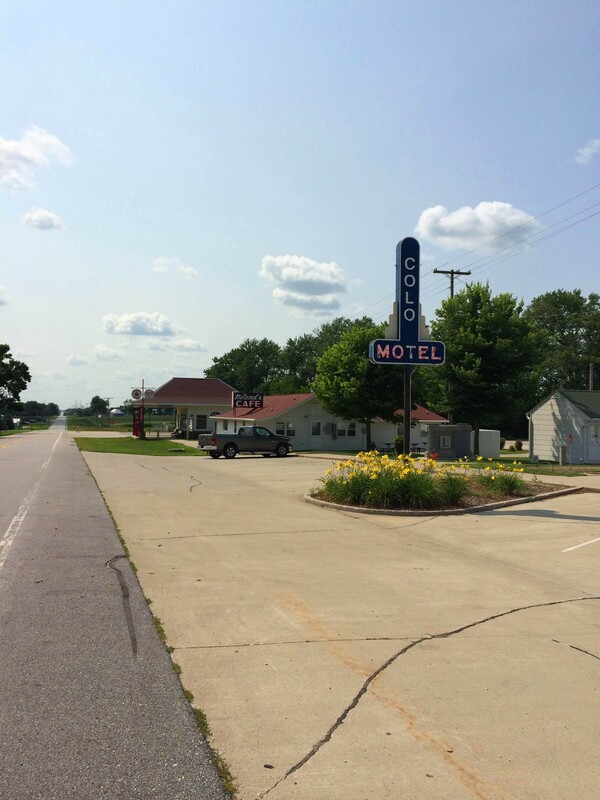 The Lincoln Highway Association is still in existence, and now serves as a watchdog organization for the preservation of the highway’s historic character. America’s first transcontinental highway for automobiles would eventually bumble through thirteen states east to west; New York, New Jersey, Pennsylvania, Ohio, Indiana, Illinois, Iowa, Nebraska, Colorado, Wyoming, Utah, Nevada, and California, helping develop nearly every community along the roadway. By the time the Federal Aid Road Act of 1916 was enacted and national roadway standards were established, roadways were marked and numbered. 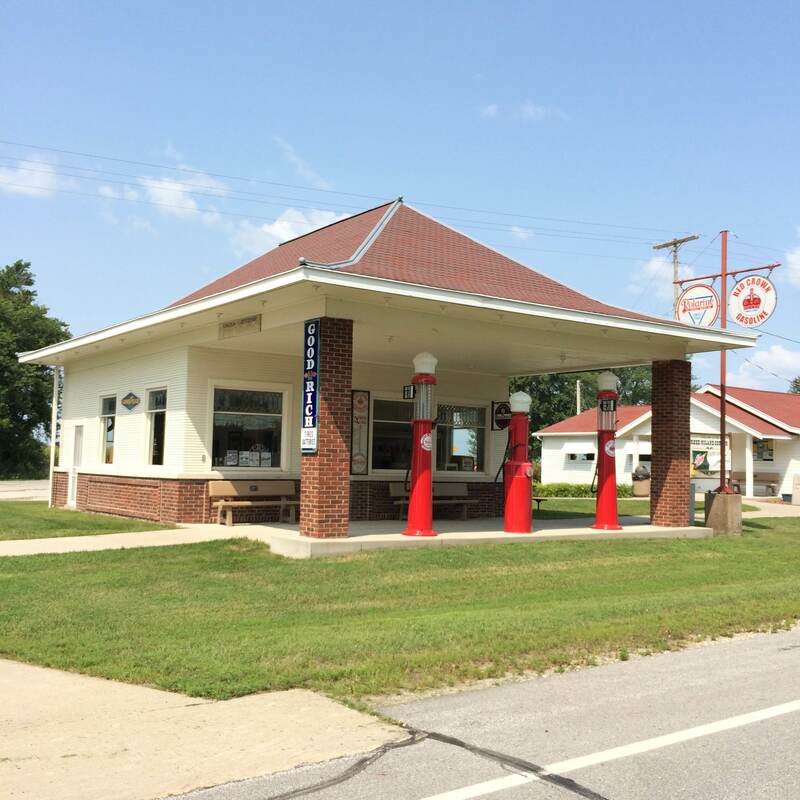 By the time state and national highways were designated in the 1920s, service stations and roadside respites had popped up everywhere along the Lincoln Highway, including the Reed Niland Corner in Colo, Iowa. In the 1920s, travelers along the Lincoln Highway (or the Jefferson Highway, which bisects the Lincoln Highway in Colo, and travels roughly from Winnipeg to New Orleans) could gas up the Ford, grab an egg salad sandwich or stop for the night at a one stop Mom-and-Pop known as the Reed Niland Corner, after the owner of the service station, Charlie Reed, and the family that ran the restaurant and the motel, the Niland’s. The service station operated as such until 1967, and the restaurant and hotel closed in 1995. The site was sold to the City of Colo by a Niland family member and was restored and reopened in 2008. 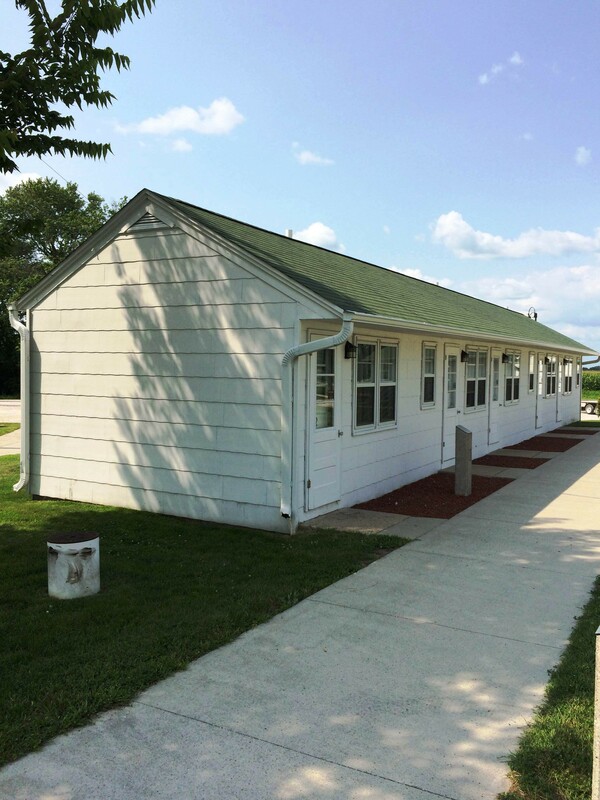 The Reed Niland Corner, a grouping of simple wood framed structures located in rural Iowa, is an exceptional and rare example of a building typology that was literally everywhere prior to the development of the modern freeway system. Sites like this seem to further emphasize the shift between travel by automobile in the 1920s and 30s, where roadside culture was built upon stops that would serve as a place to relax and refuel, and today, where convenience and speed is king. Unfortunately, most of our built heritage capturing this time in America has been lost. 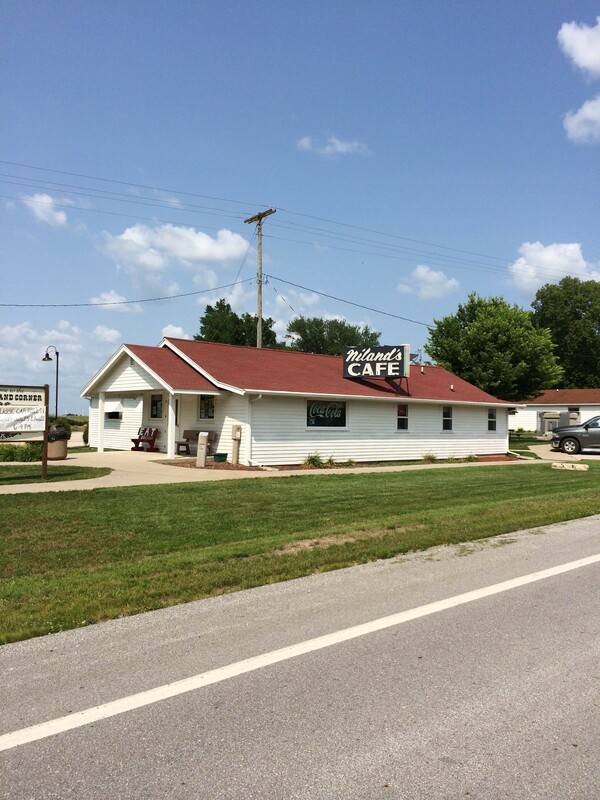 Small privatized rural highways often became a part of a larger highway system, and historic roadways that ran parallel to super highways found a limited need for a two pump service station, or a roadside diner. 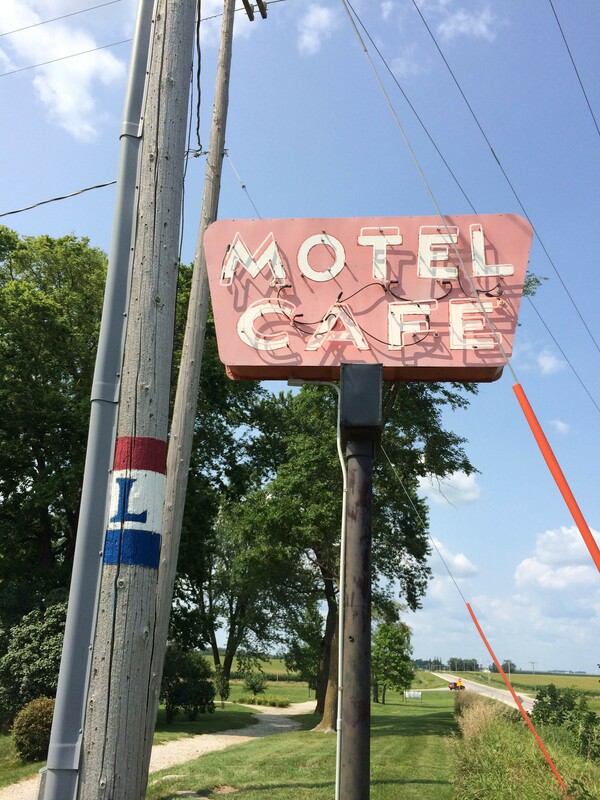 These factors, along with the holistic re-use of the Reed Niland Corner’s cafe and motel as just that, a cafe and motel, make the site even more special, and worthy of listing on the National Register of Historic Places.